As early as January 2013, and surely by April 2013 [reports vary], the Syrian army decided to set up a new unit called the National Defence Forces (NDF). The new force would be under the control and supervision of the official Syrian army. While some of its tens of thousands of members planned to fight alongside the army, the rest would be in towns and villages protecting government offices and buildings. Their function is limited — to provide defence of their immediate localities — but the effect is to free up regular Syrian Arab Army forces for offensive actions. Experts explained the formation of this special force, to be comprised of men from all districts of Syria, to the weakened operational power of the Assad army. The opposition, however, said that the militias known for their cruelty and ruthlessness were being given an official status by Bashar al Assad. Jaysh al-Sha'bi and the Shabiha are pro-regime militias that had been instrumental in the Assad regime’s campaign of terror and violence against the citizens of Syria. Jaysh al-Sha’bi was created, and continues to be maintained, with support from Iran and Hizballah and is modeled after the Iranian Basij militia, which has proven itself effective at using violence and intimidation to suppress political dissent within Iran. In a disturbing and dangerous trend, mass killings allegedly perpetrated by Popular Committees have at times taken on sectarian overtones. Jaysh al-Sha'bi is a militia controlled by the Syrian government and has conducted unilateral and joint operations with Syrian military and security elements against the Syrian opposition that have resulted in the deaths and injuries of Syrian opposition members. Jaysh al-Sha'bi [AKA: Jaysh al-Shaab; Jish Shaabi; Sha'bi; Al-Sha'bi Committees; Sha'bi Committees; Sha'bi Force; The Popular Army; Popular Forces; Popular Committees; People's Army; Army of the People] operates throughout Syria and has been particularly active in Damascus and Aleppo, where the militia has supplemented Syrian government forces' operations against the opposition. Iran helped establish and train the Jaysh al-Sha'bi militia in Syria to support the Asad regime and relieve pressure on Syrian government forces. Since mid-2012, Iran’s Islamic Revolutionary Guard Corps-Qods Force (IRGC-QF) and Hizballah had provided training, advice, and weapons and equipment for Jaysh al-Sha'bi. Iran also provided routine funding worth millions of dollars to the militia. Iran's IRGC Commander Mohamad Ali Jafari also claimed that the militia, which he claimed has 50,000 members, was modeled after Iran's own Basij, a paramilitary force subordinate to the IRGC that has been heavily involved in the violent crackdowns and serious human rights abuses occurring in Iran since the June 2009 contested presidential election. Since the beginning of the unrest in Syria, the Shabiha [AKA: Shabbihah; Shabbiha; Shabeeha; Al-Shabbihah] have operated as a direct action arm of the Government of Syria and its security services and Shabiha units have provided support to units from designated security services such as the Syrian Air Force Intelligence and Syrian Military Intelligence. Shabiha units have worked with Syrian Military Intelligence to provide security at Syrian regime facilities and to man security checkpoints in Syrian cities and the Shabiha have been used by the Syrian military during operations in and around Damascus to interrogate and kill potential supporters of the Syrian opposition. In addition to the Shabiha being identified as part of the Government of Syria pursuant to E.O. 13582, the Treasury Department also designated the group pursuant to E.O. 13572 for being responsible for or complicit in the commission of human rights abuses in Syria, including those related to repression. Since the beginning of the unrest, the Shabiha have fired into crowds of peaceful Syrian demonstrators, shot and killed Syrian demonstrators, arbitrarily detained Syrian civilians, and shot Syrian soldiers who refused to fire on peaceful demonstrators. In May 2011, the Shabiha were firing on Syrian civilians trying to cross into Lebanon near the town of al-Bire, Lebanon. On 11 December 2012 the Treasury Department took action against Jaysh al-Sha'bi and the Shabiha. These militias have been instrumental in the Assad regime’s campaign of terror and violence against the citizens of Syria. Jaysh al-Sha’bi was created, and continues to be maintained, with support from Iran and Hizballah and is modeled after the Iranian Basij militia, which has proven itself effective at using violence and intimidation to suppress political dissent within Iran. Any property or interests in property in the United States or in the possession or control of U.S. persons in which these entities or individuals have an interest are blocked, and U.S. persons are generally prohibited from engaging in transactions with them. In February 2013 the National Defense Forces were actively seeking to recruit women of all ages. This was testimony to the steady increase of women’s numbers in armed units. They were also becoming very useful in assisting male fighters, as they arouse less suspicion when transporting supplies and weapons. 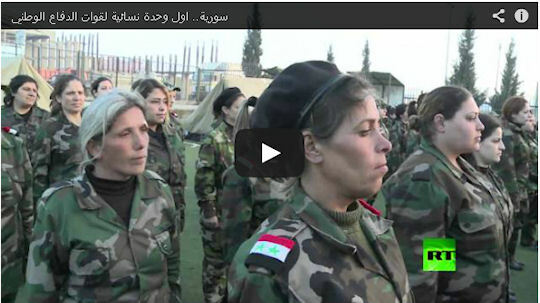 Women’s first unit of the National Defence Forces was established in the Syrian city of Homs. The unit contained 450 women aged between 18 and 50 years. Women are armed with Kalashnikov rifles and Atahdn. They are loyal to President Bashar al-Assad in "the fight against mercenaries terrorists". The trend is still small - NDF fighters say female recruits number in the hundreds - but the number is rising, and is higher if you include women who have signed up for training as a self-defence skill, but not to work. The symbolism of the NDF women feeds into the sectarian divide that has deepened during the civil war. For Assad's supporters, largely drawn from minorities like his Alawite sect, an offshoot of Shi'ite Islam, putting women in uniform and at checkpoints demonstrates the more liberal and tolerant image they want to project. The NDF were formed to regularise militias that backed Assad. Groups that once were accused by the opposition of brutal massacres now have uniforms and salaries paid by the army. They call themselves a new kind of military reserve force. Volunteers get three weeks' training in firearms, first aid and military drills. They get 15,000 Syrian pounds a week - no small sum in a country whose economy is collapsing. By May 2013 the ranks of the conventional Syrian army -- weary, depleted and demoralized by defections, casualties and more than a year of continuous fighting -- were being swelled by the deployment of some 60,000 militia irregulars trained at least in part by Hezbollah and Iranian advisers. Most of the members of the National Defense Force were drawn from Mr. Assad's minority Alawite sect, an offshoot of Shiite Islam, and they were regarded as more reliably loyal to Mr. Assad than the rank and file of the majority Sunni army. Pro-government militia were involved in kidnappings in volatile areas across the Syrian Arab Republic. In February 2013, in Al-Hajar Al-Aswad (Damascus), two older men in a car were seized while passing through a checkpoint manned by National Defence Forces. Their families were later approached and ransom was sought for their release. In May and June 2013, in Job Al-Jarrah (Homs), National Defence Forces raided the area, arresting displaced Sunnis in what was viewed as an attempt to evict them. Enforced disappearance was carried out by government forces, including Air Force and Military Intelligence, and by National Defence Forces. On the morning of 2 May, the army surrounded Al-Bayda and blocked the main exit points. Extensive shelling preceded the operation leading many civilians, especially those living at the edge of the village, to flee to surrounding agricultural areas. Government forces proceeded to raid various streets in the village as members of the National Defence Forces joined the operation. Hundreds of civilians were arrested while some were executed in various locations. Evidence indicates that between 40-60 bodies were laid out in one room, a mobile phone shop, near the square. The bodies appeared to have been burned. The victims appeared to have been first arrested and then executed in the square area. Some of the victims also appeared to have been hit in the head with blunt, heavy objects. Bodies of 30 women, also apparently executed, were found in a house not far from the center while tens of bodies were strewn in the streets. Between1 50-250 civilians were allegedly killed. Testimonies were consistent that members of the National Defence Forces were actively involved in the raids and in many cases leading them. The UN concluded there were reasonable grounds to believe that government forces and affiliated militia including the National Defence Forces are the perpetrators of the Al-Bayda massacre.